Last month, I released a series of videos on topics I feel passionate. I shared my thoughts about storytelling, strategy, innovation, leadership, and value creation. I am both humbled and honored for all of your positive and encouraging feedback. Thank you so much! Have you ever heard the saying, “… be careful what you wish for?” Well, I have decided to continue sharing my thoughts with you through a series I am launching today called What and Why First™. You see, in my world, it is all about value creation. 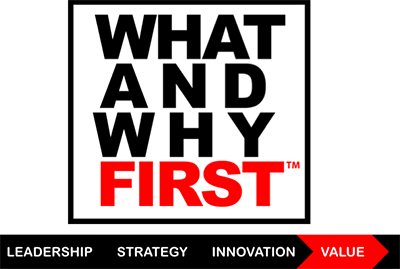 What and Why First is about applying leadership, strategic thinking, and innovation to create sustainable value. First, I believe that disruptive technologies are here to stay. Period. What that means is that every single day disruptive technologies are transforming our lives, the way we do our jobs, and influencing the core context of our professional and business environments. There is no slowing down. The pace of innovative disruption is accelerating more than ever before. Regardless of your field of industry, whether you are a solopreneur or a global organization, we are all influenced by SMAC (social, mobile, analytics, cloud), the Internet of Things, artificial intelligence, machine learning, blockchain, robotics, biometrics, and many other disruptive technologies. Second, I believe there is a direct link between leadership, strategy, innovation, and value creation. You cannot have one without the others. If we apply true leadership principles, then the strategy is at the forefront. Strategic thinking fosters and nurtures innovation. When we have an innovative framework, it is easier to leverage disruptive technologies. Only then do we have a chance to gain that 10X plus competitive differentiation and create sustainable value. Third, I believe that the more we ask what and why the more we seek to understand and share what we know with others. The more we enhance our collective awareness of how important leadership, strategic thinking, and innovation are, the better and brighter the future will be for all of us. I am very excited about What and Why First. Please, join me on this journey, it is going to be a fun! That is the what and why about my launch of What and Why First. In a nutshell, I want to create insightful, relevant content that you can put to work in your personal and professional life. If you are in a position of strategic leadership—or aspire to be—then the What and Why First series is for you. Please, join me on this journey. I want to hear from you, so send your feedback and comments, and please share this video with your network! Until next time, cheers!